Rough times, Sonny. When you are around, hope to hear how you and yours are coming along after your brother's passing. Glad to see other residents of Ditto Town feel nostalgic about the old days when 10 or more pages of posts would pass in a day. Sonny, continuing to think of you in this grief. I'm sure glad summer is pretty much over and my favourite season is about to begin. Some summers I wonder how I am going to make it through. But I always do, so there's that. Watching Hurricane Michael make landfall as a category 4. It is feeling like Fall here. Been too warmish for my tastes. The leaves are changing color. I've been watching the hurricane coverage as well. It's rained here pretty much all month, leading to saturated ground and localized flooding. And now there's snow to the northwest of here, and we may get the season's first flakes tonight. This cold, wet weather isn't doing well for the fall colors, but I hope to still get a chance to take a trip out of town next week if it dries out and warms up a little. ceppault, are you safe from Hurricane Michael right now? Admittedly, I don't know a lot about hurricanes since I live so far away from any coasts, but I thought hurricane season was over. This one seemed to come out of nowhere. I took a weekend trip with an 1 1/2 hour drive to get home today. I got to watch the world basically go from perfect fall colors to a world that looked like it had been dusted with powdered sugar. And then, of course, after I got to drive in it, the snow almost immediately melted. I have a feeling we're going to have a very short fall. Merry December y'all, sure is quiet around these parts. Just popping in to say hello and share a few updates. I'm in South Korea these days, gonna be here until around July or so. If y'all ever get the chance to visit this country, I recommend it. It's absolutely beautiful. I've got so many pictures of the scenery alone. Maybe I'll share them here sometime. Any who, I start taekwondo classes on Monday. The instructor says it takes about eight or nine months to earn your black belt, so hopefully I'll be heading back to the states with a new skill and a cool belt. It snowed thanksgiving weekend, with was super cool. I built a pretty neat snowman, which then immediately melted. How is everyone these days? I can't wait for these Netflix projects to really pick up some steam and get this place bumping again. Its recently been brought to my attention that this march will mark eleven years for me spent on NWeb, that's pretty much the most constant thing in my life other than my family, tbh. Crazy how time flies. Hope all is will with everyone and if we don't talk before the holidays then Merry Christmas, Happy Hanukkah, New Years, and a good Festivus to all. Merry December to you too, nerd! Glad to hear you're doing well - hopefully better than your snowman. I was curious so I looked up some pictures of South Korea, and wow, you weren't kidding. It looks gorgeous out there. I'll have to add that to my list of places to think about visiting if I ever leave the States. Good luck with your black belt! I took martial arts classes when I was very young, but my parents stopped paying for them when I stopped practicing. I've considered taking up tai chi again, but that's one of the many things I've thought of doing but never got around to. I reached the point last year where I'd been on NarniaWeb longer than I was alive before I joined. That... was a strange experience. I still vaguely remember a time in my life before then, but I think at this point, I've been on longer than I was in school. Which is appropriate, because I feel like I learned almost as much on NarniaWeb as I ever did in school. I'm currently househunting, which would be an exciting prospect if I could find anything I liked. I'm a first time homebuyer, so I'm learning as I go the kinds of things I'm looking for. Being on a pretty tight budget makes things extra fun. But, my realtor was the youth pastor at my old church and is a close family friend, so having someone I trust show me houses is a huge relief. Sonny, how are you and your family doing? I hope you are have a good measure of joy this Christmastide. Nerd, that is so cool about South Korea! It is quite a lovely place, but most of my time has been either in the heart of the capitol or down by Busan. We should compare notes some time. Rya, good luck house hunting! Keep us updated, if you don't mind. Life has been...busy, to say the least. I ended up never getting any herbs in this year ( ), however my dad planted fifteen (no, I am not exaggerating) tomato plants and nothing else, so no one was lacking in tomatoes, at least. I was probably going out to pick between 5-8 pounds a week just to give away, and my parents were doing the same. It was rather ridiculous. He has promised to plant fewer tomatoes next year, but he is already playing around with a trellissing idea, which I actually think will be fairly promising. A local restaurant did similar a few years ago, and theirs seems to hold up quite well. Otherwise, it has been mainly work, work, and more work. 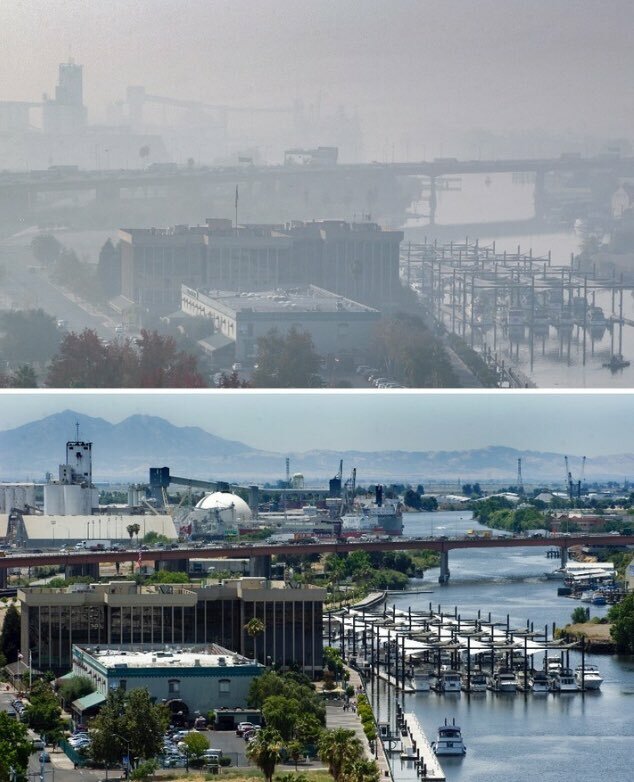 The smoke from the awful fires has cleared, which is very nice (if you're wondering, this is a comparative of what it looked like over the nearby port), however, mud after fires is also quite dangerous, as it ends up creating mammoth mudslides, among other things. But, at least you can go outside without a mask, and the fires are out. Despite the fact that I don't get a break this year (yay, me), I'm quite looking forward to winter break. It's been one of those months where everyone knows what they need to do but they're all being cantankerous donkeys about every little detail, so nothing gets done. I'm hoping most of them being off for a week or two or three will help reset some of that. I'm just glad I get to avoid attending an end-of-year wedding. Does anyone have any particularly fun or special plans for the various holidays? Beyond making unhealthy foods (yay, doughnuts! ), I've not given it much thought yet. Hiiiiii...... myself Minna I’m an Indian. I joined in this website to improve my fluency in English. Please help me when I would do mistakes in my post. Once again hello to all my frnds in the thread. thank you. I’m intrested to be a pharmacist. I would like to hear Music in my spare times. I like to cook, but I haven’t cooked yet .I probably love Jesus than anything in this world. I’m very big fan of my mom. I would read horrible stories in my spare times too. My Big dream is to go to USA once in my life time. I’m the boarding student in my college life (11&12grades) .One of the happiest moment is when I come home from my boarding college. A hearty welcome to you, Minna. It's really good to have you here. That's cool you would like to be a pharmacist! We have had a bit to do with pharmacists (here in Canada) over the decades and we have always found them very helpful, knowledge, and informative. All the best to you in this venture! Music is wonderful, isn't it?! One of my top loves. Do you play an instrument? There are other followers of Jesus here on NarniaWeb too. You are certainly not alone in that. Btw, your English is quite good. Keep practicing and you will feel even more comfortable with it. It takes a lot of courage to join a forum to post in what is not your native tongue. Way to go! Welcome to NarniaWeb, Minna! It's great to meet you. Good luck in becoming a pharmacist! I get bad headaches and am on a few medications, so I know how important pharmacists are for our world. I can imagine how happy you must've been coming home from boarding college! I've never been away from home for more than a few weeks, and even then it was so good to be home again! How many more years of school do you have? Speaking of home, Lady A asked for an update on my house search, and... I'm actually in the process of buying one! I still have to get an internet provider, but other than that, pretty much I just have to get everything packed and wait for the closing date to come. It's still not quite real, but at the same time I'm looking forward to it. It's going to make my commute shorter but at the same time it's not very far away from my friends and family. It's a small little townhouse, but since I don't have a roommate, it's the perfect size for me. Oh wow, Lady A, um... was canning all those extra tomatoes a viable option?? I suppose if you're going to have too much of something, tomatoes are better than, say, cantaloupe. At least tomatoes are versatile. Yikes, sorry to hear you didn't get a break. I didn't get much of one, either, what with having basically no vacation time by the end of the year (yay headaches for swallowing up all my paid time off). But hopefully things at least slowed down for you a bit. My job slowed down considerably - to the point where trying to scrounge up enough work to last 8 hours was a bit of a nightmare. Hi Minna, and welcome to the forum! I hope you find a nice spot here on the forum with us. I'm glad the house hunt is going well, Rya. As far as the tomatoes go, we actually did a chunk of canning, and freezing, and sauces, and salsas, and...yeah. What was the pilgrims' poem about pumpkin? "Pumpkin at morning, pumpkin at noon, if it were not for pumpkin, we should be undoon." That was us, except with tomato. I did end up taking a little time off for the holidays, and was able to see one of my friends and her family, which I greatly enjoyed. It was over all too quickly, though, and then everything was back to normal. We're actually understaffed right now, so I'm hoping we can bring a few more people on. We've had a couple leads (thank G-d), but nothing concrete, yet. Rya, that story about your niece is super cute. Little people are so entertaining! Well, here's hoping for a more diverse crop this year than just tomatoes. And I know how that is about time off. It feels like you've only just settled in to relax and spend time with family before you realize you have to go home (or they do)! I just got back from a short vacation - going back to work "tomorrow" (really later today, by the time I actually write this post) - and the amount of time I spend at work vs. the amount of time I spend with family and friends is beginning to feel truly depressing. By the way, my niece and nephew are still adorable and I still have stories if you care to hear them. My niece just turned 3 and at her birthday party, she still doesn't seem to fully understand how these presents work, because when she was told who the presents were from, she seemed to think that's who the presents were for, and would bring it over to them for them to unwrap! Thankfully, now with the house bought and my big (but short) trip out of the way, life will settle down a bit. ...Okay, that's a joke, it never does, but maybe I'lll at least learn how to manage it better. I'm trying to get back into writing regularly. The realization that I'll probably never have the hours and hours I used to have to just write for the sheer pleasure of it that I did when I was young has hit me hard recently, so I've decided to counter it with at least making better use of the occasional hour here and there I have to write. I can certainly agree that Rya's niece and nephew are both cute and intelligent. While we're on the subject, I have a story there too. When they come to visit, the 3-year-old likes a little children's book called Brown Bear, Brown Bear, What do You See?, which teaches kids colors and animals. At some point she started adding the sounds the animals make. When she gets to the sheep, she says "Baa ram ewe" (from the movie Babe). I take credit for that. Meanwhile, we're bracing for yet another winter storm. At this rate, spring might come by May. NarniaWeb was having issues last night and this morning so it's nice it's up again. Huge thanks to our 'benevolent dictator', Tirian, for his diligent work in keeping the forum running (and fixing it when it's not!). Happy Spring, everyone, although the temp is hovering around freezing here, with flurries yesterday and rain today (with some ice pellets mixed in), so feeling-like-spring has yet to arrive. One of our sons is getting married on May 4, and it would be nice for all the travelers if it didn't snow. Early May here is usually coolish, and I, for one, am so glad they did not choose July to have their wedding celebration!